Lukeion Family Tours are on hiatus in 2019 for a much needed rest. Return here for updated news about our next adventure, likely in May 2020. Many tours are designed for groups of teens/college kids or they cater to the retired crowd. We do something unusual: We build trips for families, teens and adults of all ages to enjoy as a group. We offer one of the few family-friendly tour packages available anywhere. We offer a fully rounded educational and cultural experience on our custom tours. Starting around 6 months prior to departure, our travelers have access to free live online Know-Before-You-Go sessions covering the history, culture, and geography of our upcoming trip plus our best travel success suggestions. We welcome adults of any age as well as families with children as young as 8 years old. Age 12 and up is our recommendation. All students through age 16 must travel with an adult. Older students (17+) are welcome to travel without a parent/guardian making this a perfect senior gift trip. Larger families should be aware that European hotel rooms normally house 3 or fewer. ** The bus is now full and at capacity for our 2018 Tour** After we return from Greece this May we plan to take a travel hiatus while we focus on a few new projects. Check back later to see what adventures are in store after 2019. Come celebrate our 10th travel tour anniversary in May 2018! 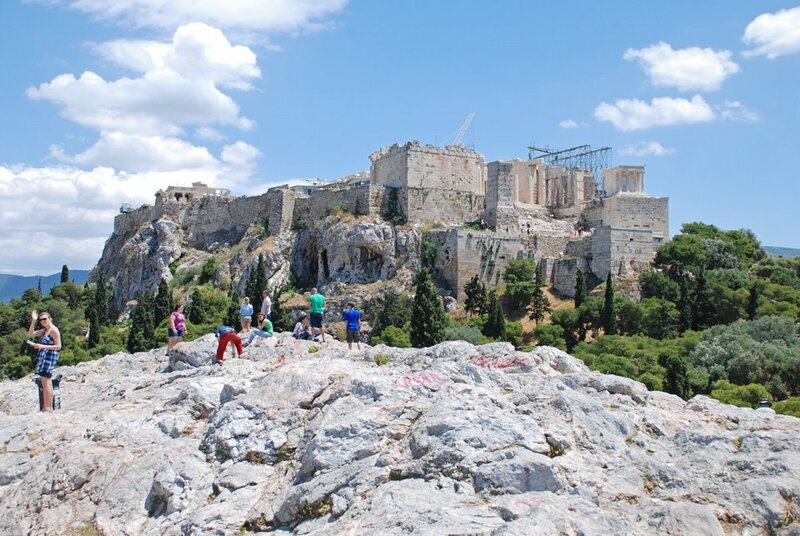 * Lukeion Project founders and Classical archaeologists Regan and Amy Barr with EF Tours have crafted the best possible itinerary for those interested in the archaeology, history & culture of Classical Greece. • When? CONFIRMED dates of Wednesday, May 22 through Tuesday, June 5, 2018. • Special travel arrangements? EF Tours can adjust your flight arrangements if you wish to depart for Greece early, leave late, or depart from another airport besides Atlanta. • Who? Students age 17+ and families/adults with children as young as 12 (ask about younger travelers). NOTE: adult pricing applies to ages 20 and older. • Rooming arrangements? Students share triple rooms, adults share double rooms; upgrades (ex. a student moving to a double) require a small fee; family rooms are available as triples (not quads). • How strenuous? Moderately strenuous: we will do a lot of walking up/down hills, some on uneven and rocky terrain. To register or for more details from EF Tours, go here. *After the Greece Anniversary Tour 2018, Lukeion Tours will enjoy a much needed hiatus. “A ship is safe in the harbor, but that’s not what ships are built for.